Alexander the Great , considered by many to be the most successful Military Commander who ever lived. So we do not take his name lightly with September’s challenge and make this a series of seven challenges with firm commitment to train for seven days. 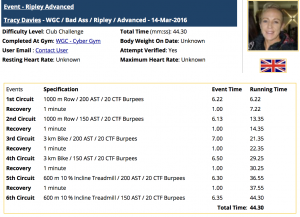 These are based on the results of former WGC Gym Athlete Tracy Davies records of the challenges that she had completed in the past. Obviously you are not expected to beat all of these times, but you can see the split timings for each challenge and final times. The challenges are based on equipment and exercises that you will find in a gym and in most cases, will be doable in most gym layouts as they mainly use CV equipment and Bodyweight exercises. You must complete all seven challenges in any order to pass. This is a little tricky to set up but hopefully if you came in pre prepared you will have with a fixed bar weight of either 20, 25, 30 or 40 kg for a duration of 40 minutes. You will need a method to record 5 and 2 minutes and a pen and paper so you don’t forget your results. There is now the simple task of completing 5 minutes of each station for as many reps as possible and as much distance as you can gain on the treadmill and rower. 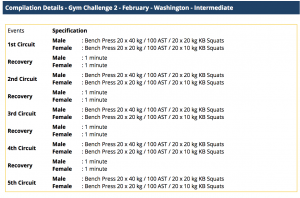 What is the World Gym Challenge ? And why do we need it? There is massive confusion the Fitness Industry and that is just fact. Do this , do that , don’t do this , don’t that. Eat this , eat that , if you eat more of this you will get amazing results. In fact if you do it this way you will be fitter, stronger and look amazing. Frequency – Attend the gym at least 4 times week. Recovery – Recover in between bouts of exercise and also rest days to recover. Spent in a gym will get you results when applied in the correct amount. Thats it ! What you actually do is the key in any format, but keep doing it and make sure you enjoy doing it. Yes , thats right. But how? 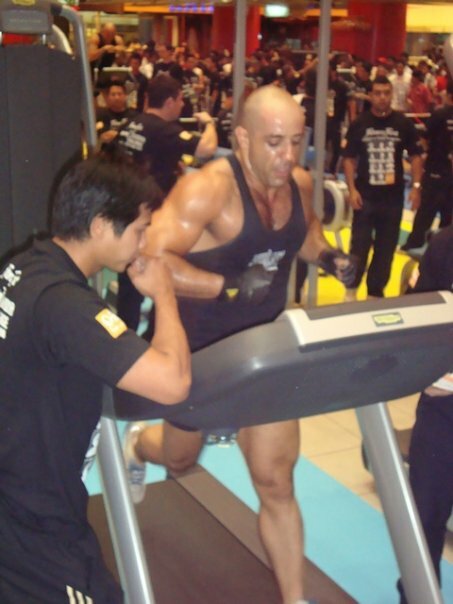 You see most gyms will not run gym challenges as it takes up time and resources to execute them. And with good reason. 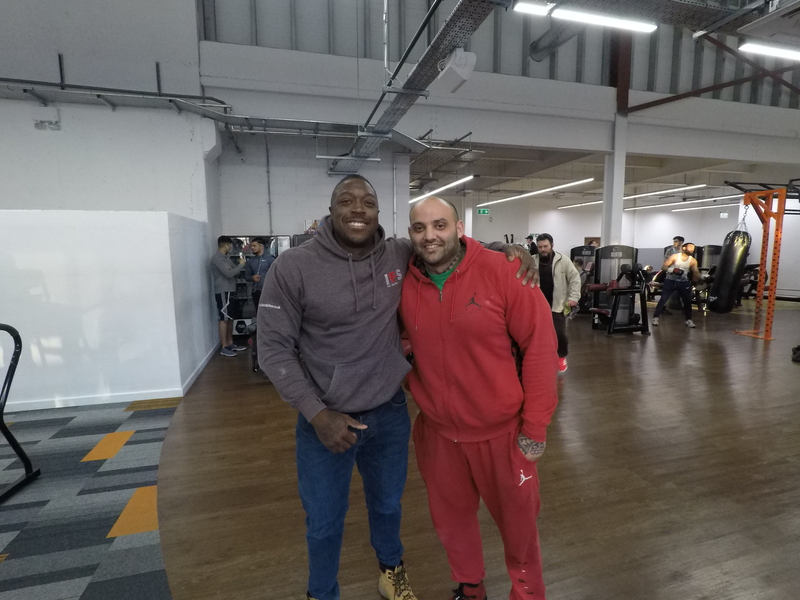 The majority of gym members just aren’t really that bothered and there is nothing wrong with that , because as long as they are going and doing what they enjoy , who are we at WGC to point fingers ? No we are looking at the gym member who likes to be challenged and there just isn’t an option at the gym you train because the gym rightly so will not run them as the members are in effect afraid to put themselves under the spotlight. So move on to CrossFit and see where those members who wanted to be challenged have headed and there are lots of them. CrossFit is without doubt the surge Industry in Fitness, that is somebody who grew from an existing market to create another market because the original market refused to adapt. But who wants to do CrossFit and you will find an ultra competitive athlete , continually on the look out to improve doing CrossFit Wods. So thats where WGC came into the frame , we have been around since 2006. Before CrossFit was popular in the UK and we looked towards magazines such as UltraFIT to gain our inspiration. 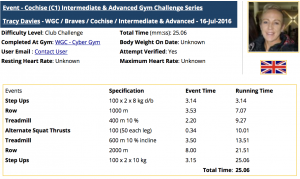 Author adminPosted on 30/07/2018 30/07/2018 Categories NewsLeave a comment on What is the World Gym Challenge ? And why do we need it? 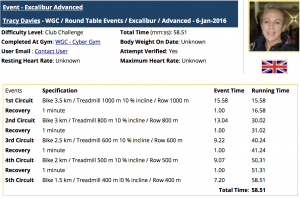 World Gym Challenge is pleased to announce the introduction of the best ever Treadmill Challenge – ever ! 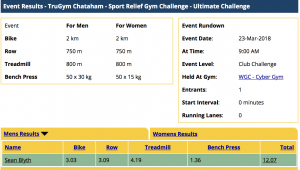 A Treadmill Challenge has to be able to be replicated in any gym, so its no good making challenges ultra complicated or so hard that hardly anybody can attempt it – I mean what is the point ? Take the 400 m it’s a round track and everybody can run 400 m , right? Thats the beauty of it. But you can’t set up a track in the inside of a gym, but you can run 400 m on a treadmill. Now lets just add a little bit of difficulty to it. Run it at the speed that you think you can do. Make it harder you say ? Yup , ok. 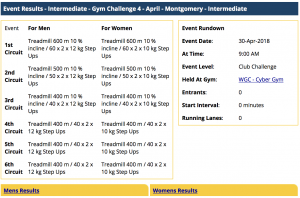 Lets make two distances 400 m Intermediate and 600 m Advanced. 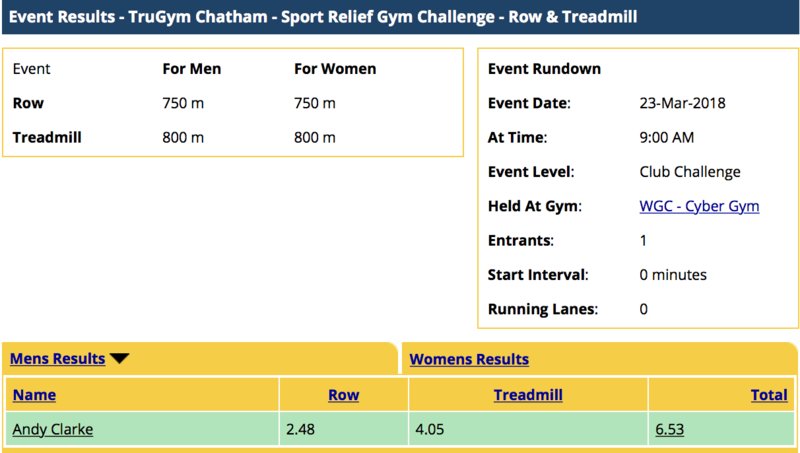 Now you can’t change the speed until you have completed the either 400m or 600 m.
Fixed Incline Treadmill Running (FIT-R) is completely exclusive to World Gym Challenge and will give you the edge when preparing to race mentally. Don’t take our word for it though, try and pop onto a treadmill and see for yourself. On 10th May I visited ExCel in London to once again pace the walkways of Elevate . The lead Expo to showcase the innovation and creativity that supports the trends in the Industry we call fitness . As normal I look at these shows as what to expect in the gym and what changes I will see coming to influence patterns and training in the gym. 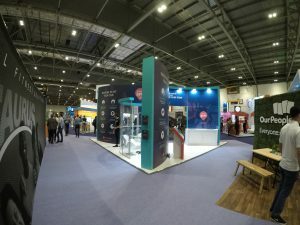 The highlights of the show were few and far between, the you know – the WoW oh my Gawd this is just want the industry needs knock you off your feet moment. No, sadly these aspects are saved for the what next mundane and socially acceptable routine – The Zumbaesque impact. I did see a few Bounce Activities which is some sort of class which involves bouncing on a small trampoline to some sort of dance aerobic class. It looked fun and tbh just frankly disappointed me to think this is where the industry is heading. I have walked these pathways before, looking at the colourful stands and image friendly inviting portals to the next must buy unit at your gym, but there is a degree of , seen it all before and if Im honest it hasn’t changed since the early days of LIW. I did enjoy seeing the rise of Woodway, a treadmill that caught my eye many years ago. 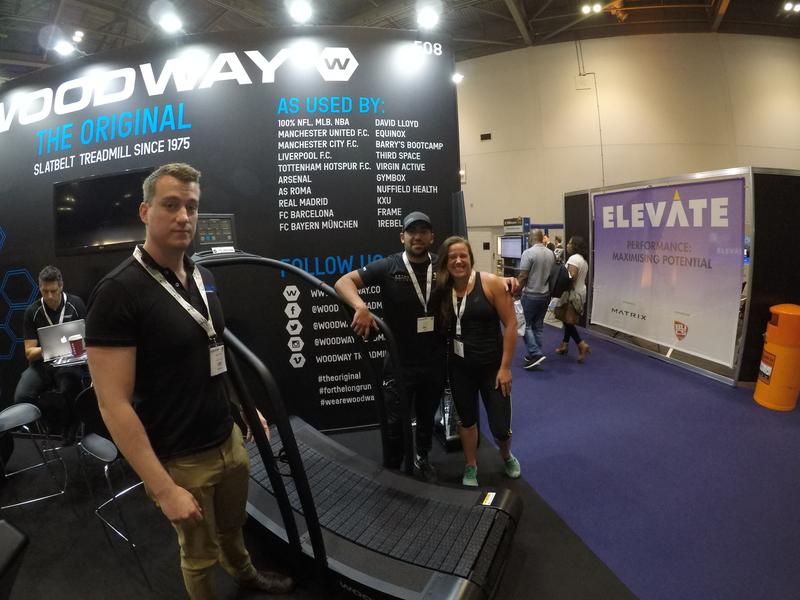 It is now one of the big players in treadmill design and a must have unit for your gym. I noticed at the same time that Technogym and Life Fitness were not present, which did make me think why not ? The traditional rock solid Wattbike and Concept 2 were there and nothing has really changed for my love for these two pieces of kit. So what was there that caught my eye ? And all I could see was a slight momentum to the word performance – you could see there was an inkling and a nod to see a world that is unfurling in front of the industry that is now playing catch up to CrossFit who have this market cornered and where the blinkered tired and looking for a quick buck industry which has lolled around and watched something that grew up under their noses and they decided not to act, but think that they were being innovative with their insight into what catches the attention of gym members . All I can really say , is that the likes of what I use in the gym has not really changed in the last ten years. The gym model is so stale and boring that its almost an embarrassment to anybody who want to take seriously there fitness , something to which the impact of running Sport Relief Challenge at the gym I train at this year told me more about the Industry as it is now then any Expo that I attend. You see I asked members to put their performance to the test at the gym they train at – baring in mind they have been training for many months or years in some cases, and the response in the overriding majority is that were just not interested – a casual glance and then a swift shake of the head and a move away in haste so as not to actually get pressured into taking part . As I walked the pathways of Elevate I could only relate to my experience of what impact all of what I was seeing today would actually make a change to the future of training in a gym, and I was reminded about the Bounce routines that I witnessed and the look of terror as I asked members of the gym I train at to take part in Sport Relief Challenge. My experiences with those who I have asked about the current situation in gyms does not paint a picture that is particulary complimentary – a business model that is aiming towards performance , yet has no evidence to suggest performance is something that the gym takes seriously enough. What is even more damaging to the industry is that the current member does not really know how to train for anything other Body Building or muscular aesthetic appeal which caters for the image of how one person should look to be socially acceptable, all of which the industry was trying to avoid and shy away from after several disastrous advertising campaigns. It seems we are now looking towards CrossFit to lead the way in performance related market that is backed up by those who attend CF classes and for those that enter events, because the very thought of something similar happening in gyms is still as far placed as the moon is to kick it as a football. Because that is what I took away from Elevate, what is a tired and lack lustre fitness industry for the member is a lucrative healthy balance sheet and somewhere along that equation with rising health issues nationally is a question that is not yet be asked – what exactly has the industry done in the last ten years , what is it aims for the next ten years and how on earth do we get that spark back into it for the member? As the years add up I think the opportunity is now to look at the journey into Gym Sport . So I thought it best to look at some of the high’s and lows of my personal journey in recording the events I have been at. The people I have met and the conclusion of the future of gym sport. Lets just take a look at Gym Sport in its basic form. By looking at my favourite event of all time The Marlow Gym Challenge (18th July 2010) A Gym sets up a gym challenge for members to take part in in a race format. That’s two members (athletes) racing down a course set up , using the equipment you use daily in an event you could possibly be training all year for. So as you can see , when implemented into a working gym, there is such a sense of community and success, that the whole day is something of a when’s the next one attitude by members . I also had a great race on that day taking on Andy Brown in what would be many encounters, which he would constantly beat me. Those events were memorable for all the right reasons having just had a great day, followed by a BBQ and the potential for another one. Although the day was memorable the sad news was The Marlow did not continue. It stopped after one event. Gym Sport is not going to happen unless its part of the DNA of the club. Unless Gym Sport is embraced on a massive collective level by all members and those that take on the level of commitment to train. And the modern day Gym is just not structured to cope with its own sport. This is the conclusion that I have come up and its is hard to take as there is a resounding sense of failure, which was not brought on by lack of hard work. Gym Sport was never meant to be a personal journey, but that is how it has ended up. Lets see what happens when it turns into a success story for a single gym, and the event HXT at Hampshire(David Lloyd )is proof that continued events are run well between member and management of a gym. Liam Florey and AJ Orchard race each other at the Hampshire XT 2017 from sean blyth on Vimeo. But this is the minority of a sport and is in fact a very successful event of which it cannot be a Sport driven entity. When you look at the bigger picture, and look at the fitness Industry as a collective, you then have to see who opposes gym sports and the answer is quite surprising. 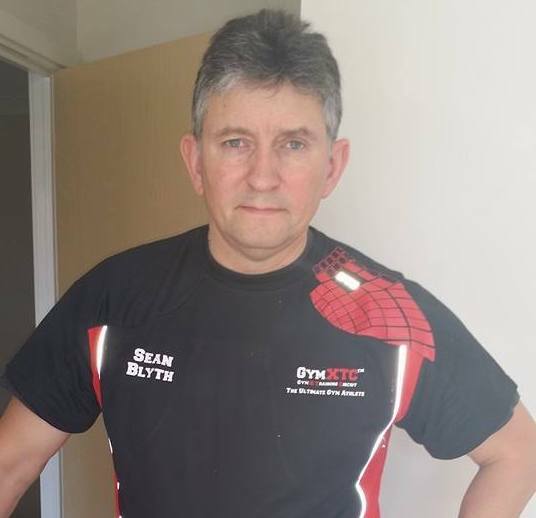 Now this may look at who is to blame for the failure of gym sport without taking any of the responsibility for myself and first and foremost that has to be me. Did I take an easy route without looking at the hard graft first ? So lets look at me then on this journey. 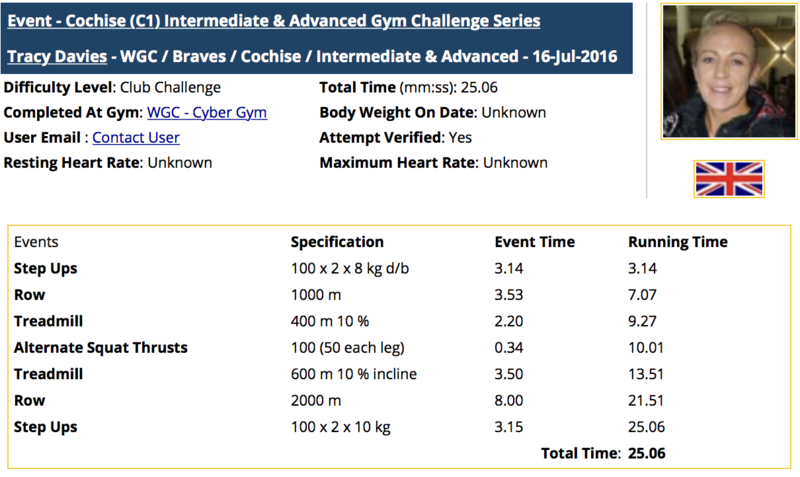 A sport needs a history of events and its accompanying Data to make it a sport – that is the premiss of World Gym Challenge. capture the data, interview the athletes, create a spark and let momentum carry the sport into the next stages. Thats was what was needed and my website is littered with endless hours of writing reports, completing all the photography , creating and learning video techniques. And travelling to events to record all of this, along with the results that were entered into personal folders for those who took part. I think the hard work part of this story is unequivolically undeniable and again presents a problem . You see if you are the person adding the hours to the Sport , then you become the target of those who resent the intrusion into their existence , of which none of what I was doing was done before. Events were put on, the athletes took part and everybody was happy – that is also undeniable. It works well either way – So what makes me the one who wants to a see a sport grow? The answer can be found in the execution of events. Each organiser did an exceptional job. The events were a joy to be at – the athletes, performed to exceptional levels and those that were there saw and witnessed records being broken and the longevity of events was secured as long as there were venues that would support and host them. 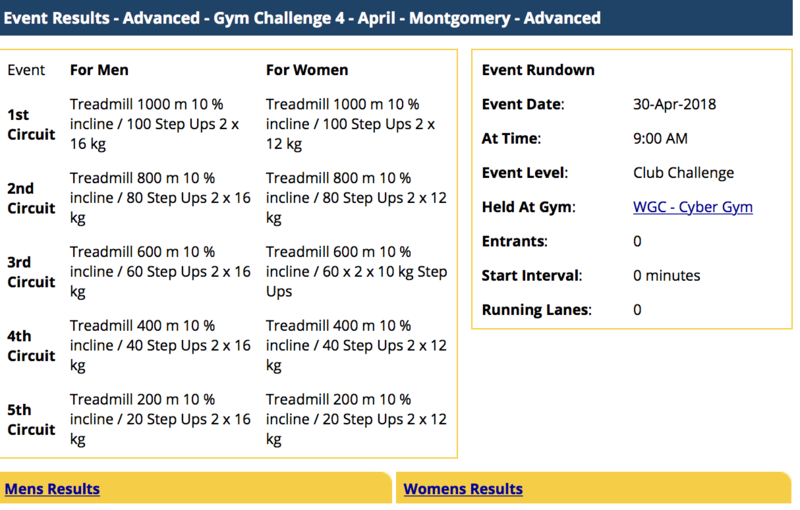 The gym sport series continues for the WGC Gym Athletes into April. 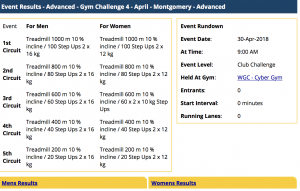 10% Incline on the Treadmill features heavily in the Advanced categories with Paul Morton designing the Advanced course, to help him focus on an upcoming event. 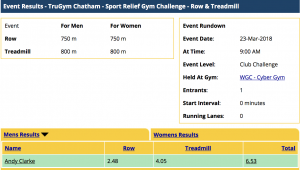 The Intermediate was tweaked by Sean Blyth, to incorporate a transition from endurance incline, to sprint treadmill at a consistent 400 m for the last three circuits. As normal with WGC circuits the focus is completion without ‘gassing out’ to incorporate total Performance targets to meet as you approach each station. 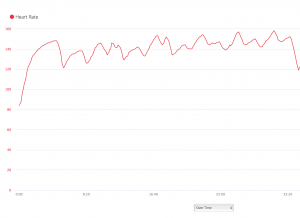 The transition to speed on the last three circuits gives in to a new style of running , but the heart rate will peak to the same level. With the aim to complete all the step ups without a pause. There are no forced recovery stations on this circuit but you can take recovery when ever you need it . On the 22nd and 23rd March Sport Relief took place and we put some members through a series of gym challenges . Thats where I came in. I have the background into Gym Challenges and the enthusiasm to carry it out. Although the challenges were open to everybody surprisingly only one female took part, but overall the day provided a bit of fun and was well received by those who took part. 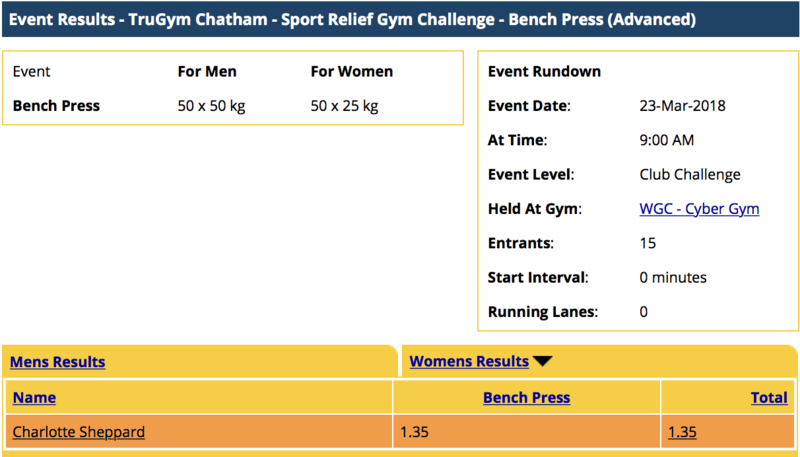 The most popular event was the 50 x 50 kg Bench Press and this saw some good timings, and a good mixture of competitive robust grit. When asking members to try this challenge , there were obvious choices , the big guys were keen, the smaller muscular types also , but as a rule , there was a look of uncertainty as to whether they wanted to attempt it at all for fear of not being able to submit a a rapid time. 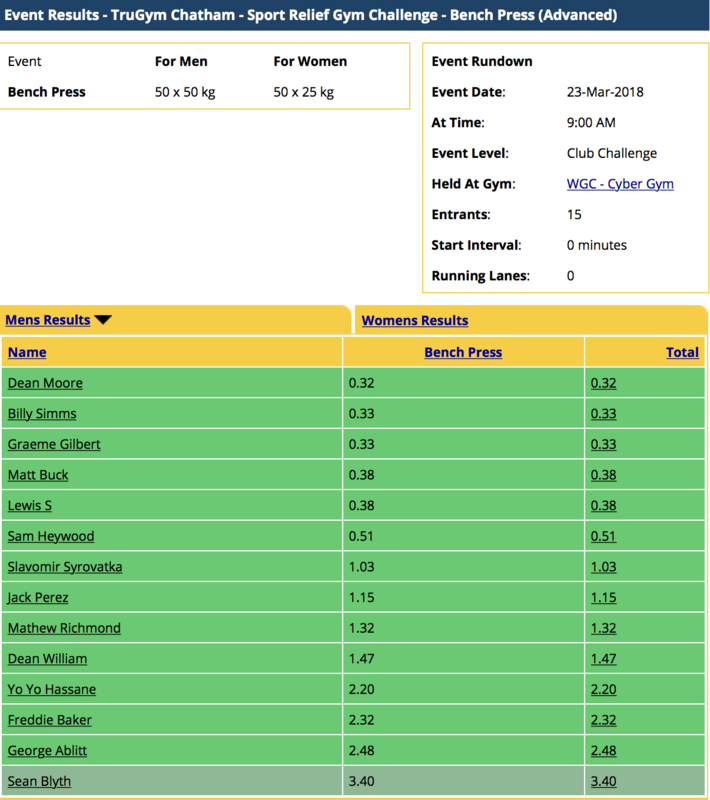 No one took part (apart from me previous to this) of the 50 x 30 kg Bench Press, almost as if it would be somewhat embarrassing to try something that was 20 kg lighter then the toughest challenge. On one occasion I stopped somebody on the 50 kg (for safety) and on another occasion one member stopped because he could not complete the 50 in one go. The lactic had kicked in and rather then wait , shake out the arms a bit, refocus chose not to complete it. Which was a shame as I was sure he would have done a reasonable time. Two guys stuck during the supervised Advanced Bench Press challenge were Billy Simms and Matt Buck, obviously friends and training partners and both very capable of the challenge. But the winning time went to Dean Moore who submitted a result from the unsupervised part of the day with a time of 32 seconds. 2 Entrants both from the management side of things, and both impressive results from Jack Woodard (2.38)and Kemel (2.50). 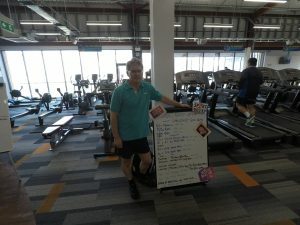 I was surprised that the 800 m did not attract more of a combined entry level as it is an extreme and harsh blast of cardio for both male and female members and probably not trained for enough in the current climate of HIIT training. The second most popular event. I chose 750m as the 2000 would be too much of an ask and be a bit too time consuming under the circumstances. But this was none the less a very well paced challenge with some good consistent steady rowing. 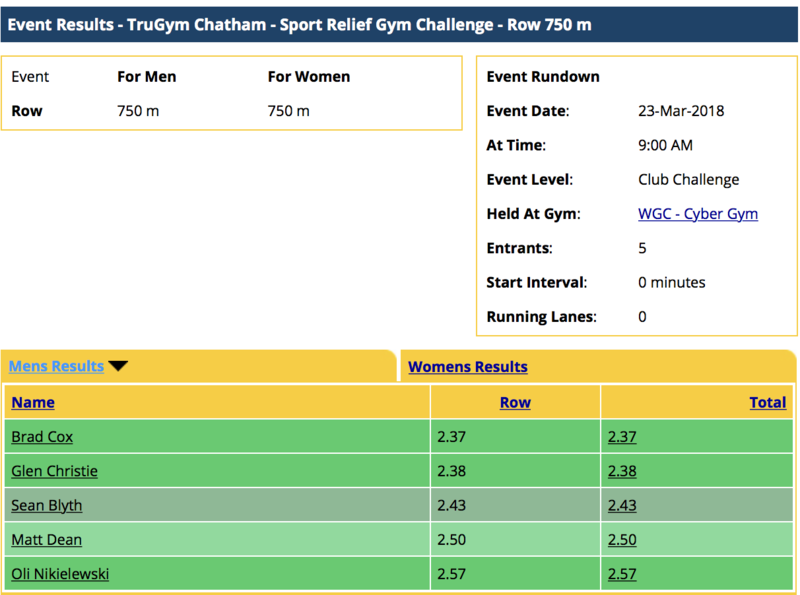 For a fitness club to find an exceptional talent for rowing is a tough find – again no female entrants but some determined rows all round. 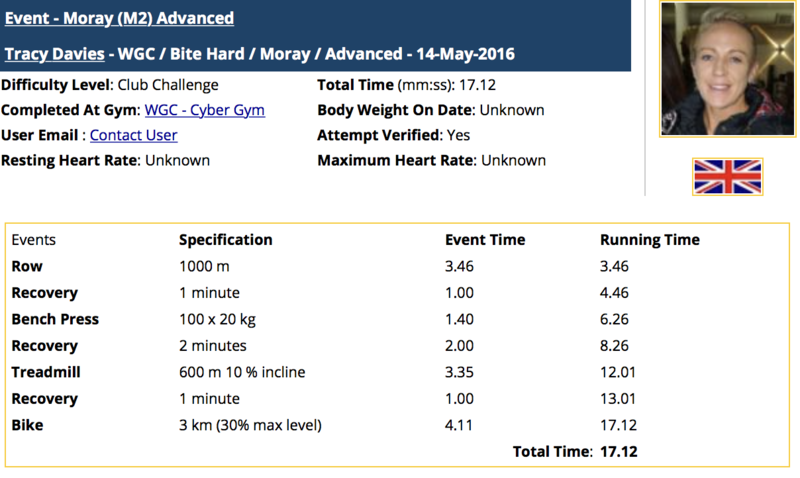 Two phases of the Gym Challenge were multi Sport based -and somewhere where performance of the day was achieved. Andy Clarke a head chef from Rochester BAE Airport , can be found most days at TruGym, at 48 decided to lose in excess of three stone to the present date and gave a cracking performance which was by far the best result achieved for somebody in his 51st year. It would be fair to say that from my perspective that the actual Sport Relief message did not filter through into the gym. If those that took part were doing this for Sport Relief then, it was not something I witnessed. Most did not know that Sport Relief was on, or that there was a community aspect to raising funds, but at the very least it was a starting block for some to look at their fitness levels and see what they could achieve. 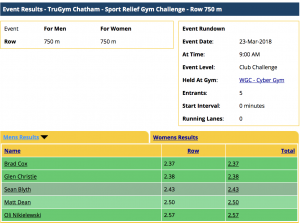 It was first and foremost a fun day and on a social media platform the potential for all of the TruGym clubs and indeed all gyms in the UK to have taken on the same challenges was there, which is where the bigger picture lies. But yet it seems , asking members to test themselves, push themselves, go into that dark zone where you will find your limits is still a long away from the mainstream gym, which also means the potential market is much bigger too , if the the simplicity of training returns to the gyms. Many thanks to those who supported this fun day – Derek Hanbidge, Manager and the Front of House Team of Gym Instructors and staff. 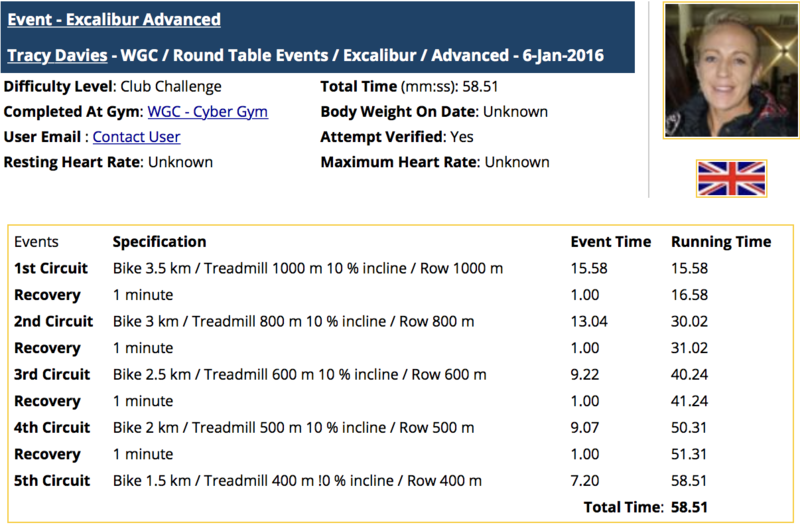 The 2nd Gym Challenge has been released into the WGC database. Designed so that all is needed is a Kettlebell and Bench Press and around 30 minute completion time for maximum use on equipment. Do not attempt the level of event to which you are clearly not conditioned enough to enter. FitBrit is the closest format for what WGC offers gym members. 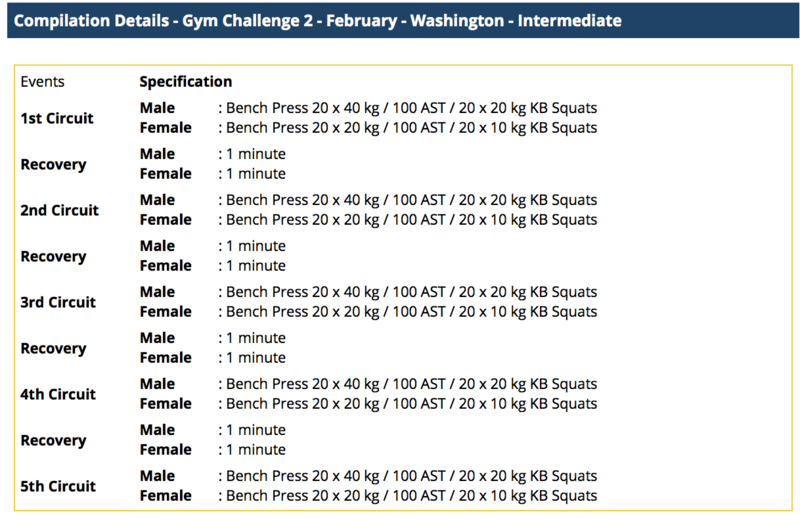 In principle it is trying to find the fittest members of gyms by offering a competition based gym challenges based on time. The winner being the person with the quickest time. 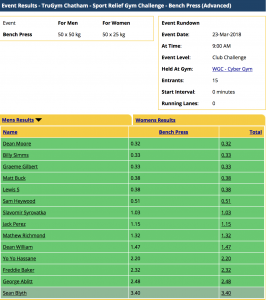 The differences between WGC and FitBrit is that WGC looks at the significant split time of all the elements of training and events for gym challenges , whereby FitBrit is just a final time scenario. There is no such gym challenge on this planet that is deemed the hardest. All that can be learned from them is the comparable differences in the final times. In this , FitBrit fails, but where it succeeds is the amount of people that take this challenge on. Most gyms in the UK do not provide gym challenges for members to train towards, but DW Gyms and Fitness First have combined in an effort to find the fittest from their members. WGC spoke to the female winner Nicci French from Poole Fitness First and asked here about the gym challenge and winning in 2016 and 2017. What is the secret to winning FitBrit ? Do you miss the races between you and Tracey Davies? 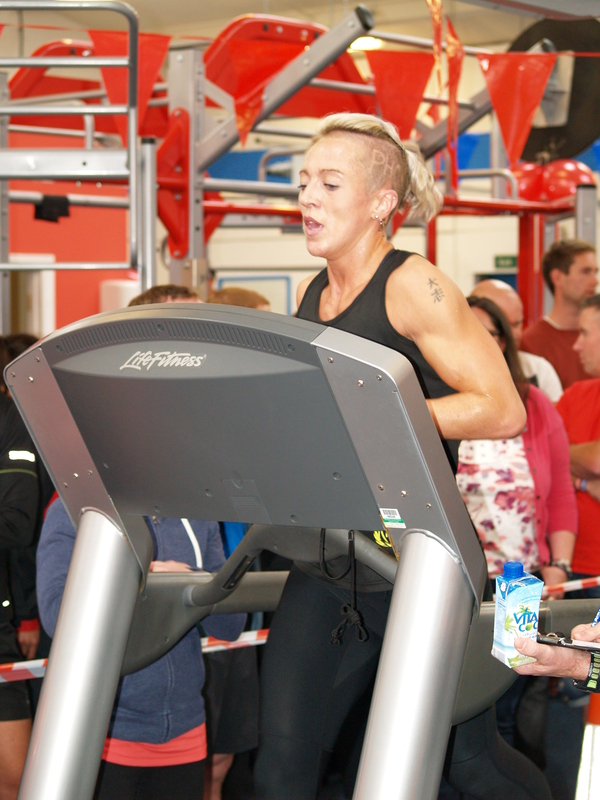 Tracey Davies and Nicci French’s races against each other were always close year on year at the FitBrit Finals. Tracey stopped competitive racing in 2015. Yes, the competition was good between us. I had beaten Tracy and she had beaten me- then we were 2 seconds apart in our final race! Would have loved to have paired up for an event with her! What advice would you offer in how to train for FitBrit? I have stuck to the same format over the years I have been taking part. Practise is key in this event. You are a masters category athlete . Why do you think you are beating those younger then you ? I think that women can become fitter and stronger as they age. Plus I train harder now then when I was younger as I have more time now that my children are older. I am more determined and focussed now I am older as I always think that this could be my last year! What did you have to eat on the day of the final ? This year I was away from home so I ate slightly differently. Generally I would eat corn cakes with nut butter followed by natural yogurt with fruit and nuts. I would have a snack about an hour before I competed- either a banana or some nuts. 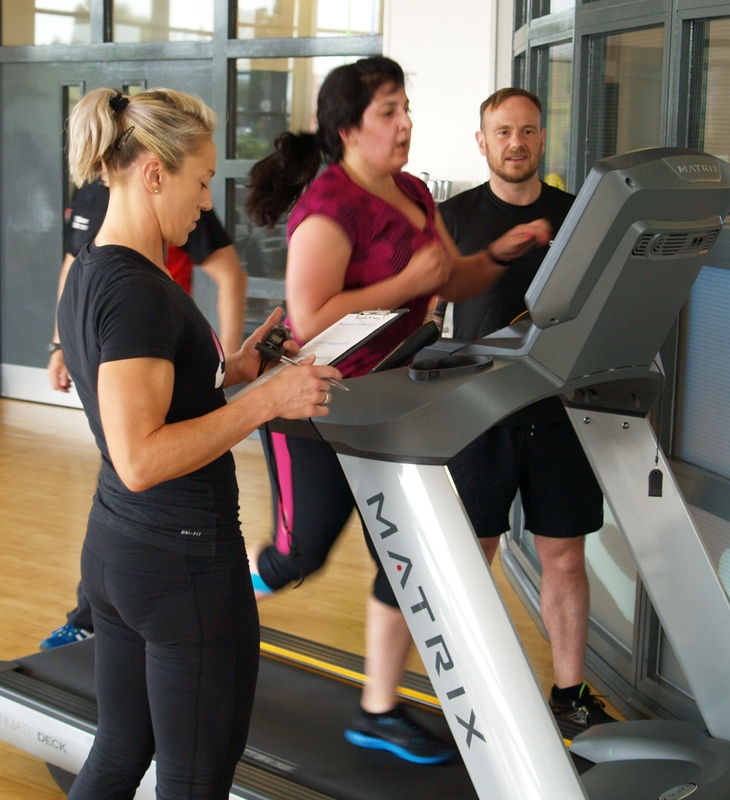 What benefits have you been given by Fitness First ? I have received free membership to Fitness First and a variety of other prizes over the years. The best year was winning a racing bike plus £250 of sports clothes! As a female in your gym and winner are you a role model at all to other members ? It would be nice to think so! I think I am proof, along with a couple of my friends, that you do not have to lose your fitness just because you are over 30. You can become stronger and more focussed but may have to tweak your workout. The aim of FitBrit is to find the fittest gym members , how do you think this has transpired ? I think it is developing well, especially now that DW are involved. There are more competitors nationwide so it will be interesting as more DW members get involved. It is the 10th year this year and I believe they are planning something bigger to celebrate this. Have you ever considered CrossFit? I have not considered joining a Crossfit gym but some of the training I do is similar to the Crossfit style. I enjoy combining strength and cardio in intense short sessions. The World Gym Challenge also provides circuits which are intense and challenging! 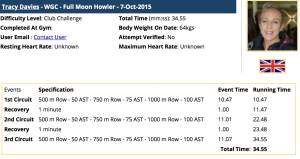 Whats the golden rules for keeping motivated and focused for performance ?